Last week IKEA launched its fifth Life at Home global research report. 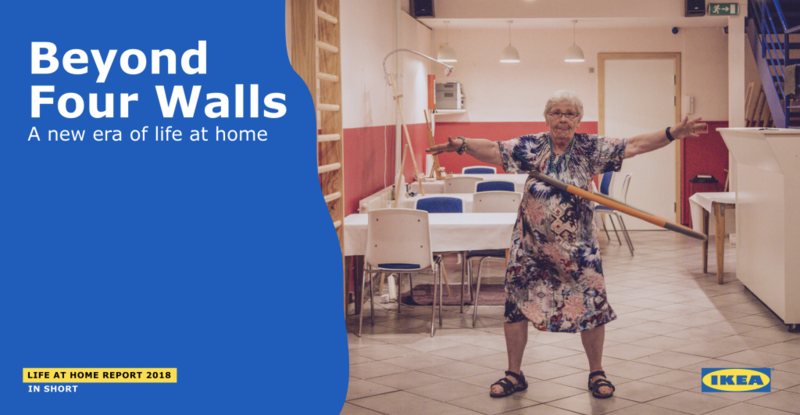 Every year, the company sets out to understand more about what makes a better life at home by connecting with thousands of people where they live. Ever since the 2016 report, IKEA has been harbouring a deep curiosity about where the feeling of home really comes from. Back then, 20% of the people they surveyed said there were places where they felt more at home than the space they lived in. Two years on, 29% of people say they feel this way, rising to 35% of those who live in cities. In 2018 IKEA wanted to know why lots of people feel this way. So they went off to explore what gives people the feeling of home, and where they go to find it. They identified five core emotional needs connected to the home: comfort, security, a sense of autonomy and ownership, and the capacity for privacy. This is what people mean when they talk about the feeling of home. These needs are universal but they play different roles at different stages of our lives, depending on how old we are, who we live with, and where we are in the world. However, there is a gap between expectation and reality, particularly amongst those living with friends or strangers. For too many people, home doesn’t give them the feeling of home. Today, lots of us are looking to spaces and places beyond four walls to provide us with these emotional needs.